The surgery itself seems to have been a great success. Medically they did exactly what they wanted to do. My sore throat from surgery is gone. The extreme tiredness from anesthesia is gone. It’s gotten easier to talk while swollen. I can lean forward without it hurting now. I’ve learned to drink from a cup for pure liquids instead of a syringe. While tired all the time, I do have enough energy to shower daily and do some walking around the house. I have not panicked when throwing up. While many people complain their skin breaks out/ gets oily after surgery, I’ve been the opposite. I normally have very breakout-prone skin and I have not had any problems for a week. Some tingling in the numb areas; that’s promising for return of future feelings in those nerves. my sister-in-law made me great soup that was a good change from what I have, and is going to make some more. I have the wonderful support of friends and family that are giving me regular encouragement. My husband has been amazing day and night, and will drop everything for me if needed. Finding out I would be bound 4 weeks instead of 3. I expected 3 weeks, when he said 4 I was disappointed. That’s having to deal with that at work since I only have 3 weeks off work. Then that I will probably have to wait all four weeks before eating soft foods. There’s only so much space to slurp things down around the back of my teeth. That swelling would make it so much harder to talk and eat, on top of the being bound together. That nausea would be a constant companion. That I would breathe like Darth Vader for days on end, so loud it distracts myself sometimes. That on Day 7 I would have problems with new swelling. I expected the first week would be the most difficult. I have read this over and over. That it is not only physically but mentally and emotionally as well. However knowing that ahead of time, it’s not the same as experiencing it. I mentioned the anxiety i had night before last, after the Oxycodone built up in my system. I was sure I would have a better night last night. I only tried some ibuprofen at supper, and a low dose at that. No other pain pills and I was super tired. In my afternoon nap I had a split second of panic when I woke up unable to breathe. There was drainage in my throat and it took me a second to orient myself and get breathing again. Just a split second; I was okay. Then last night I went to bed and this happened twice again. I was sleeping soundly for maybe an hour, then fell back asleep and half an hour later it happened again. These two times it was just a little scarier. I jerk upright, cough a little and force myself to breathe. I go rinse my throat out with water. Just a second or so but I feel that flash of panic. I feel so vulnerable in this state. After the second time I went back to sleep and dreamed a dream. I have crazy dreams all the time; this is quite typical for me. But the dreams don’t normally affect me in real life. At then end of the dream when it should have moved on to something else, it didn’t. I lay there awake, trying to get away from the evilness but I can’t. I am immersed in the dream though awake. I am tense, stressed and all alone. It will not leave me. I sit up and rock in bed, throw the covers off and back on again, pray, do whatever I can to escape but I can’t. Also my facial swelling has changed in the last couple of hours. I can’t tell if it’s enlarged or just moved around on my face. I fear I have hit my face somehow in my panic earlier and caused it to swell more. I am having a harder time with breathing and words. I did not know that my worst battles of the first week would be over something I cannot see or understand. I am in a situation that I cannot control for a second night. I am tired but cannot sleep in my bed. In the end I call my husband and turn on all the lights downstairs. I sob as I talk to him (i.e. write it all down), letting out the stress and the panic and the vulnerability to my fragile state. It hurts to cry, physically, so I try to not twist my face in the middle of it all. It amazes me that “bad dreams” or whatever it is could affect me so much but I am assured I am not crazy. In the end the practical suggestion to move to the recliner in the den and try to sleep there is what works. I turn the TV on an inococuous channel and DH sits with me for a while to make sure I am okay, and I fall asleep for the rest of the night. I’m so thankful for his physical presence with me, representing the Divine one that I know is there but can’t feel. To everyone who has read, commented, texted, emailed, prayed, called and offered to help this week; thank you. Words cannot express what each of you mean to me and how much I value it all. Today’s pics, though I think they look about the same as yesterday. I tried to smile but it’s not happening. Besides I just went a battle of Lois vs. Liquid Motrin, and I’m not sure who won. Off to take a nap. Hey Lois, reading your Day 7 I really appreciate your raw honesty in not sugar coating your feelings or the physical and emotional difficulties you are having to deal with. I hope you don’t have any more scary episodes with breathing. That must have been terrifying. 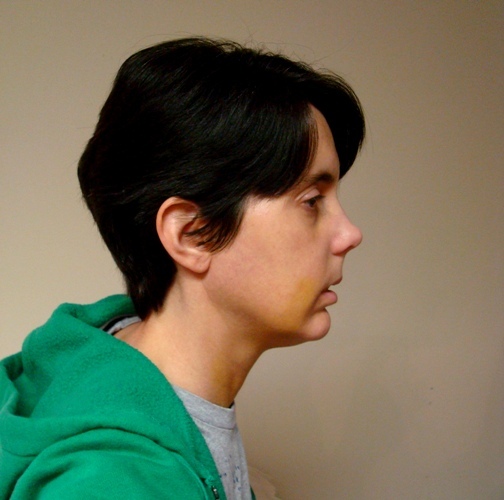 Of all the people I’ve seen on the internet post surgery, you seem to have the least amount of swelling. It was also good to read your list of positives. It must be very difficult to get the liquidised food in. I was wondering how you get it past your teeth. I presume you have a small gap for the liquid to get through? How long does it take you to drink a cup of something? Also how much weight have you lost? Best wishes from down under and looking forward to your continuing updates. Hi Deb, thanks for your comments. I don’t have any gap to get food in. There’s just the little spaces around the teeth where the food flows through. I have the splint in, so that eliminates all space where the teeth meet. In the very back, according to the models, there is a little space between the wisdom teeth and the cheeks. It takes forever to eat; I feel like I am eating all day with little to show for it. Breakfast took me two hours to get down; that was about 12 oz of smoothie. Water and juice go faster. I’ve lost at least 12 lbs; I didn’t weigh today. You are such a strong woman! Being able to step back from your pain, and objectively write about the good/bad is truly admirable. I can’t believe you didn’t panic when vomiting! I really admire you for that one, because when I threw up…I definitely panicked. And I’m not even banded shut! Now that you’ve made it through hell week, you should start to regain some of that energy back. As far as the nightmares, I can only imagine how incredibly frustrating that must be. I had one nightmare that effected like you’re describing, and the only way of consoling me was to recite St. Michael’s prayer over and over again (my boyfriend did and it actually helped). Have you tried natural remedies too like chamomile tea or melatonin? It may help give you a restful sleep. 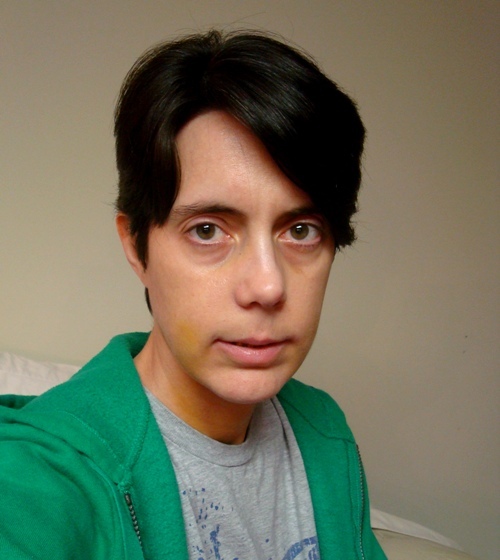 I’m at a month out now, and I still have some swelling, mostly in my cheeks. Unfortunately swelling will be our companions for some time…keep your head up, you’re doing amazing!! (Oh and I had the same bruising, it actually went all the down in my chest because of vomiting, should go away in a few days) Good luck! Thanks for the encouraging words. I am looking forward to things improving even little by little. I know the swelling takes a while to go down; do you still have pretty good pressure on your face? I am wondering how it is before that eases up. I will try some chamomile tea tonight, I have some now. They will! I don’t have any more pressure on my face, unless I bend down or try to lean back. Then I start to get that “ow” feeling. I think the pressure and throbbing should subside before day 10, I didn’t start sleeping without ice on my face until day 8 or 9. After that, I felt a huge improvement and could actually stand the way my face felt. Hopefully the chamomile helps, even if it’s just a little. Thinking and praying for you Lois! Warm hugs are being sent your way!! Can I bring you anything??? Soup? Magazines? Movies? Thanks Tiffany! I think I’m good for today.